Okay, so this week we have had not one but two class meetings at the kids' school. 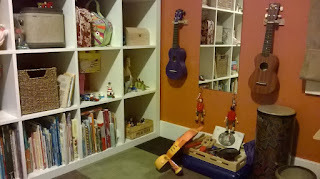 The one with Ella's 1st Grade class inspired me to do a little adjustment of the playroom, which I thought I'd share with you here. Well, in the last two days we've been able to greatly improve what's going on here. So after we got the carpets professionally cleaned (for the first time ever~! 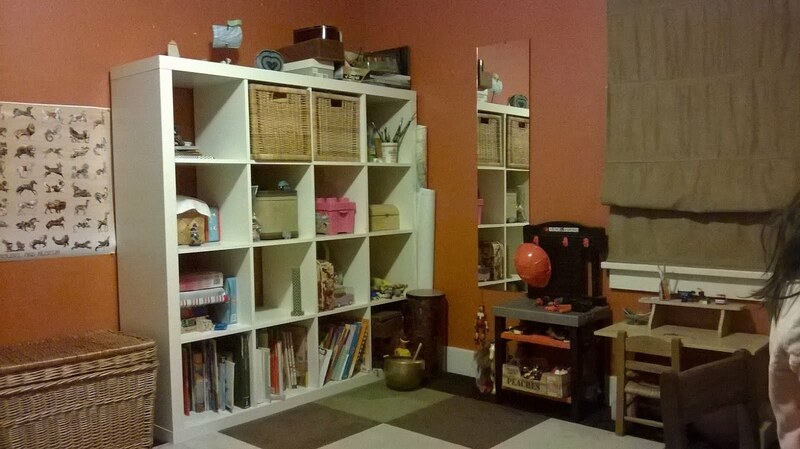 ), and we had to completely gut the playroom, I figured it'd be as good a time as any to rethink the playroom space before filling it back up with all the old items. That's right, the musical instruments -- which had been practically hidden in that bottom-most corner cubby of the shelving unit -- are now free to be accessed and made much use of! The conversation at the 1st Grade class meeting that inspired the coming out of the instruments was this tangent we took about live music vs. recorded and it got me thinking that we do have a nice array of instruments for the kids that have been sorely neglected due to poor storage but which are already bringing much joy to the kids (and friends who come over!) now that they are out and about. The main conversation at the class meeting was about screen time, and it really inspired me to buck up and remedy the lenient policy we've taken on it in our home. So we are back to our September standard of "no screen time except on Friday, Saturday, and Sunday." And even then, no more than a couple of hours in total. I feel like we have a solid grasp on the quality of what the kids see, but the quantity was getting a little ridiculous. It really helps the kids moods when they have that kind of screen restriction (less overstimulated and more fulfilled), and I can almost literally see William, in particular, exercising his mind in a way that you just don't get from watching shows or playing video games. A'ight, well until next time. Take care and Happy Music in the Playroom! !